There’s nothing all that wrong with most of the Mexican restaurants in the Burlington area. Even 10 years ago, Vermonters probably would have been thrilled just to have more than 10 spots in Chittenden County serving south-of-the-border fare. Now we have options ranging from the slightly-better-than-Taco-Bell offerings of Moe’s Southwest Grill to the sometimes-opulent margaritas at El Gato Cantina. But, thanks to foodie TV programs and travel, today’s Burlingtonians are a tough crowd to satisfy. 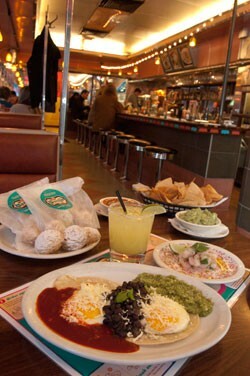 Many lament that they still haven’t found simple, fresh food that’s more Mexican than Tex-Mex. They may finally find an answer to their prayers in El Cortijo Taqueria Y Cantina. Between carefully sourced (read: good-quality) nonseasonal ingredients and the use of local foods when possible, El Cortijo does the near impossible: It brings the taste of a sunny Mexican market square to gray, wintry Burlington. El Cortijo, which translates as “the farmhouse,” shares with the Farmhouse Tap & Grill its owners, Catamount Hospitality, and its chef, Phillip Clayton. In many ways, however, the newer restaurant, which opened at lunchtime on New Year’s Eve, has met its goals with more success than its big brother did. Over two visits, the menu offered no major disappointments and several home runs. Diners who aren’t diner purists, though, may find the building’s interior more or less the same, minus its original seats and with a new wooden bar edged in the awning’s colors. Both bar and booths were fun places to park for a casual meal, complete with food photos above the counter that reminded me of ordering at American Steakhouse as a kid. The bathroom is something special. Suffice it to say, you may feel guilty sullying the toilet. Even on a recent Monday evening, El Cortijo was packed, but fortunately two spots were available at the counter. With only 35 seats to offer, the restaurant’s owners encourage takeout. “Don’t freak out … If we’re full, simply place your order to go,” the laminated placemat menu instructs. Online ordering is coming soon, as are inexpensive lunch combos, which will make it even easier for me to bring tacos back to my desk at Seven Days. I’ll be sure to order the lengua taco when I do. Yes, that means tongue, and no, you don’t need to grimace. Just think of it as cubes of beautifully braised, flavorful beef with an appealing crispness on the outside. Paper-thin, pink slices of radish add color, but most of the wrap’s flavor comes from a dense helping of cilantro and the best salsa verde I’ve had in Vermont. That salsa verde is El Cortijo’s secret weapon: Anything it touches turns almost overwhelmingly delicious. Its tanginess made me salivate, and a pleasant burn grew with each bite. I chose it instead of the salsa roja with my order of salsa y guacamole. The rumors are true: The chips at El Cortijo, kept warm in a contraption that resembles a movie theater popcorn machine, don’t automatically come with your meal. With salsa, though, they’re just an extra $2.50. Add guacamole and it’s $6, well worth the expense, since the portion is large enough to make a meal. The guac was suitably creamy and more flavorful than many I’ve sampled locally, but I wouldn’t have minded a little more lemon or cumin. Mixed with a bit of salsa verde, though, it was perfect. Nearly every one of the nine tacos on the menu — along with daily specials — has a different sauce. Only the lengua and spice-rubbed pulled chicken share the verde. No complaints there, though I found the latter taco to be slightly overfilled with lettuce. I want meat to dominate, not serve as an accent. Filler wasn’t a problem in most of the tacos. They’re small, but three are plenty to make a meal. At $3.50 to $4.50 each, I found them a good value, considering the labor involved in handmaking everything from tortillas to queso fresco, and the cost of high-quality, line-caught fish or grass-fed beef. The former appears in the form of ceviche and a crispy fish taco, so delicately fried I could barely tell where batter ended and fish began. I loved the tart purple cabbage slaw that dressed it, too. The cerdo taco, filled with slices of barbecued pork shoulder, was also noteworthy. Like a black-on-black outfit, the dish was composed of layered smoke flavors: first local pig, then pleasantly spicy chipotle sauce. The taste trend was broken only by the smooth and yielding corn tortilla and some lettuce shreds. Though not usually a drinker, I couldn’t resist the call of the “caliente” margarita, flavored with jalapeño essence. Fresh lime juice sweetened with agave nectar gave the drink a sweet-and-sour edge on which to balance a powerful burn that ran down my throat with each sip. The salt-rimmed cocktail isn’t so much a whistle wetter as a main event. Without a doubt, El Cortijo caters to meat eaters and fans of booze and beer (cans of Tecate reside in the cooler alongside local craft brews). But it’s also making an honest effort to please vegetarian customers. From queso fundido to pepitas, or spiced pumpkin seeds, almost all the appetizers are meatless or can be made that way; the tortilla soup, for instance, is available with or without chicken. The vegetarian camote taco, however, was my least favorite of the lot, with its centerpiece of chunky organic sweet potatoes, braised kale and the aforementioned pepitas. Its guajillo salsa was the mildest, both in terms of spice and overall flavor, a fact that didn’t help the soggy kale. I preferred that salsa when it appeared in two dishes at El Cortijo’s weekend brunch. The first was the $8.50 huevos divorciados. That’s “divorced eggs” to you Americanos, a name that comes from the dish’s traditional cute plating. These two over-easy eggs on tortillas just can’t seem to get along, as customarily indicated by the barrier of chilaquiles or refried beans between them. When I tried it at El Cortijo, the breakup appeared more amicable. The two eggs rested on separate tortillas atop a pile of melted queso fresco, but circles of red and green sauce rested between the two, along with a smattering of cilantro and chopped raw onions. I guess those were community property. The black beans on the plate were a lovely addition, striking a vivid balance of fruity and earthy tones. We also sprang for the $3 side of breakfast potatoes. I’m not usually a hash-brown fan, but these were brilliantly seasoned, crisp and layered with finely sliced onions and red peppers. Mint limeade was another nice touch, prepared that morning in the restaurant’s giant, counterside juicer. Chorizo tacos, stuffed with housemade sausage, could have used more spice, but they made a pleasant combination with scallion-speckled scrambled eggs, queso fresco and more of the mild guajillo salsa. Then I bit into the first truly memorable new dish of 2012. On paper, the tocino taco isn’t so different from the chorizo or even black-bean brunch options. It has the same scrambled eggs and ample stuffing of cilantro. The difference maker is the wow-worthy combination of ultra-creamy queso fundido, cubes of meaty housemade bacon and that lustrous, luscious salsa verde. For more than an hour after I finished it, I felt restless, still tasting it and wanting more. Is there a better way to sum up burgeoning addiction? To put an end to the torture, I tried both of El Cortijo’s desserts, which are available plated or prepackaged in wax paper to grab and go. I chose the latter option. The Mexican brownie was dense and chocolaty, but benefited from undertones of cinnamon and coconut milk. It wasn’t spicy, as I had imagined. That is, until the final bite, which left my lips burning with a clump of unmixed chile flakes. To the surprise of this chocolate lover, I preferred the Mexican wedding cookies. Covered with powdered sugar, flavored with almonds and a whisper of cinnamon, they crumbled with buttery élan. The $2 bag held three, but I could have easily eaten several bags in one sitting. And that’s the beauty of El Cortijo. With its small portions and prices to match, I can try lots of different treats — such as the stellar Navajo tacos, composed of ground goat meat and “three sisters” veggies (corn, beans, squash) on fry bread, a recent special prepared by former ¡Duino! (Duende) chef Richard Witting. Or I can simply gorge on my favorites. Tocino taco, I’m looking at you.